MANSFIELD, Mass. – It was a game of contrasting emotions for Foxboro (17-2-1). The Warriors went from euphoria, after scoring with 1:17 left in regulation to force overtime, to tears when Sunday night’s Div. 2 South quarterfinal against Cohasset at Mansfield’s Alumni Field ended in a remarkable shootout about an hour later. Following a 2-2 tie in regulation and through two scoreless periods of 7-on-7 overtime, Cohasset edged out the Warriors 4-3 in a penalty shootout that featured several momentum shifts and several dips into the rule book. Cohasset’s Jane Hansen, who scored both goals in regulation, missed the opening chance of the shootout when Foxboro goalie Julia Carangelo forced her to make an extra move and the ball hit her foot. Lily Daly, who scored the opening goal of the game and was dealing with a hand injury that she suffered in the first half, scored her penalty to put Foxboro ahead. That was just the start of a crazy 20 minutes. On Cohasset’s second shot, Carangelo forced Katherine Cunning wide and her shot smacked off the post, but the official ruled that while diving Carangelo had thrown her stick at the ball. This resulted in a penalty stroke (not a shootout-style attempt), which was dispatched by Emma Stephens. Sophia DiCenso regained the lead by taking contact from Cohasset goalie Caitlin Durkin and still finishing. The shootout was 3-3 heading to Foxboro’s fourth shooter. Freshman Katherine Collins lost control as she got to Durkin and the goalie was able to clear it and keep the shootout tied heading into the fifth and final shooters. Stephens scored again on her penalty to get the lead. Jamie Notarangelo was taken out by Durkin during her penalty attempt, which resulted in a penalty stroke opportunity. Foxboro turned to Daly, but her shot hit the inside of the post and stayed out. The drama of this game started long before the shootout. Hansen’s second goal of the game put Cohasset into the lead and sent the Skippers bench into hysterics with 23 minutes left to play. The visitors held onto the lead and gave up very few scoring chances for the Warriors until the final 90 seconds. Foxboro was up a player and drew a corner. Daly played the ball out top to Michaela Ames, who teed up DiCenso for a rip. The ball skidded into a crowd of players on the edge of the crease and Sophia Lowe redirected it inside the far post for a game-tying goal with just 1:17 on the clock. 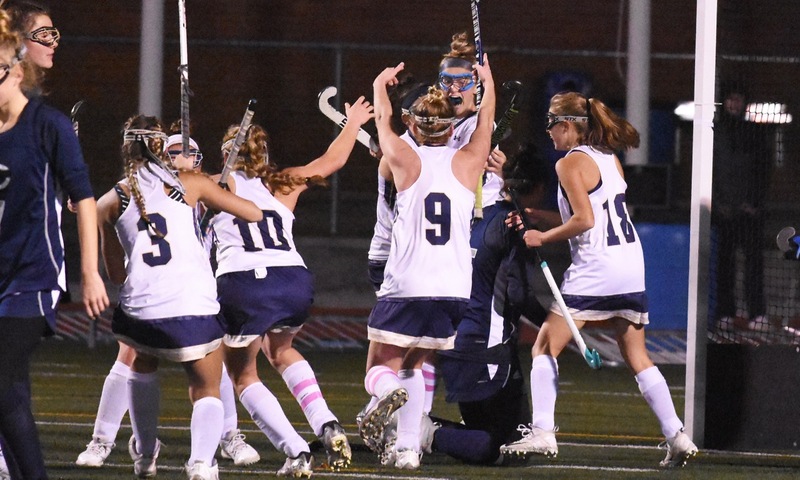 In the overtime periods, Foxboro, which had advanced with a double overtime win in the first round, had a number of scoring chances to possibly win the game. Notarangelo tried to get on the end of one but it slid out of play, DiCenso picked out Daly on the break but the shot slid just wide, and then Daly again got open in the middle but Durkin stepped up to make the crucial save. DiCenso nearly worked an opening in the second overtime, but her cross to Daly, who was wide open at the back post, was cut out by the Cohasset goalie. In the final minute, Meghan Currran was able to find Notarangelo but it was saved and then the Warriors were given a corner. On the set play, Daly sent a shot towards goal that hit a Cohasset player standing on the goal line in the chest. Foxboro coaches were incensed when it was ruled dangerous play, despite the defender being behind the goalie, which would have meant a last-second penalty stroke. After going to a second overtime before scoring against Falmouth in the opening round, Foxboro took only seven minutes to find the back of the net on Sunday. DiCenso fired in a backhand shot from straightaway that Daly was able to tip past the goalie for the early lead. The first half was back-and-forth. Cohasset used its speed up top to create chances and both Caroline McGeary and Kristin Whalen were forced to stop breakaways. Whalen also cleared a shot off the line and Carangelo made two of her five saves. In the 19th minute, Cohasset tied it with a perfect give-and-go between Hansen and Maddie Donovan. In the second half, Carangelo made a huge stop on a Hansen breakaway to keep the game level, but that only lasted two more minutes. Carangelo made another big diving save but the rebound went straight to Hansen and she made no mistake from close-range. It was a physical, competitive end to the game and the Warriors battled to the final seconds to force overtime, but unfortunately for the hosts couldn’t capitalize on overtime chances and were forced into the coin flip of a shootout.